Residents of Central Park Apartments are in the center of the best of our Sunnyvale, California, location. Silicon Valley is famed as the headquarters of many cutting-edge companies, including Juniper Networks, Advanced Micro Devices, Spansion, and Ariba, as well as host to the aerospace giant Lockheed Martin. But it is certainly not all work and no play in Sunnyvale! Our garden-style apartments in Santa Clara County are close to the sand volleyball and tennis courts of Braly Park and the sports leagues and activities of Sunnyvale Community Center. Enjoy a big game at Levi's Stadium, a star-studded show at nearby Shoreline Amphitheatre or take in a concert at the Mountain View Center for the Performing Arts. A beautiful life is in the balance at Central Park Apartments. 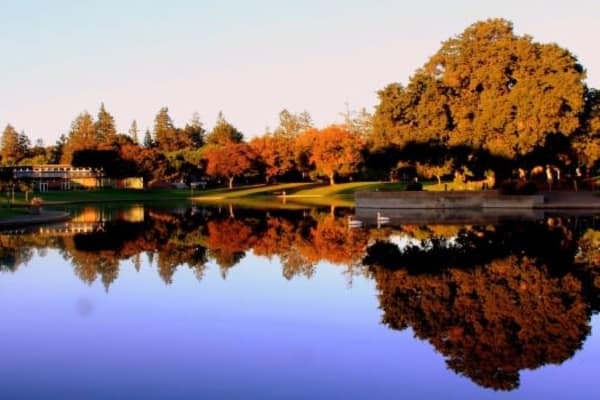 From the dozens of shopping and dining opportunities in downtown Sunnyvale, to the eclectic offerings right outside your door at Central Park Apartments, you’ll have a delicious time getting to know the neighborhood. Admire the colorful artwork while you grab a kebab from DishDash. Sip sake and munch on the fried rice balls at Tanto Japanese Restaurant. Kick back with friends with a pint and some karaoke at Blue Max. Day or evening, Sunnyvale serves up a full menu of tasty options. Come for a tour of our one and two bedroom floor plans at Central Park Apartments and experience Sunnyvale, CA, in the heart of Silicon Valley.